How many homeless people live with disabilities? The Ontario Human Rights Code has a rather long definition of disability, but it can be loosely summarized as any physical or mental condition that affects mobility, understanding, learning or day-to-day functioning. 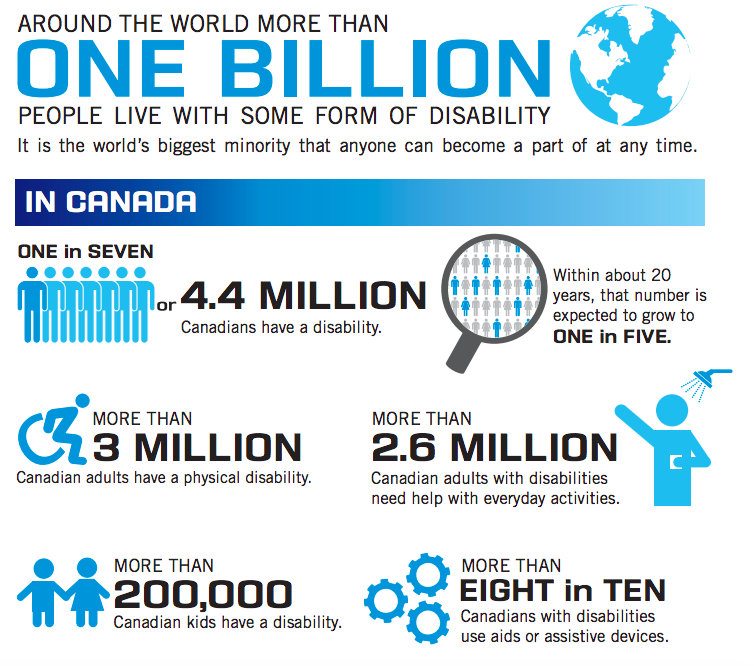 The Rick Hansen Foundation estimates that 4.4 million Canadians have a disability and that within 20 years, this number will grow to one in five Canadians. The organization also refers to people with disabilities as "the world's biggest minority that anyone can become a part of at any time," yet many are unable to fully participate in society. So while we don’t have concrete numbers on how many people experiencing homelessness in Canada live with disabilities, we know that there are many. The Center for Justice and Social Compassion estimates that 45% of all people experiencing homelessness are disabled or diagnosed with a mental illness. Given that the Canadian Survey on Disability showed that 13.2% of Canadians self-identified as disabled in 2012, this shows just how over-represented people living with disabilities are in the homeless population. In Toronto, we’ve seen comparable numbers. Street Health Toronto found that 55% of people experiencing homelessness had a serious health condition, and of those, 63% had more than one. In a different study the organization conducted, 16% of their sample of people experiencing homelessness had been diagnosed with learning disabilities, compared to 2% of the city’s general population. In a report by the Daily Bread, it was reported that 49% of people frequenting Toronto food banks have disabilities. While poverty plays a large part of why people living with disabilities are more likely to be homeless, there are a few more interrelated causes: employment issues, difficulty securing benefits, and a lack of supportive housing. Employment is a major issue for people living with disabilities. According to A Report on the Equality Rights of People with Disabilities (2012) by the Canadian Human Rights Commission (CHRC), the unemployment rate for people with disabilities was 8.6% versus an overall average of 6.3% in 2006. In that same year, just over half of all people living with disabilities were employed. A survey by BMO Financial Group found that few businesses hire people with disabilities: 3 in 10 in 2013; and 69% had never hired someone living with a disability. This remains an issue even though more than 75% of the respondents said their disabled hires met expectations (62%) or exceeded them (15%). The same report also acknowledged that discrimination could hinder employment, with nearly half of all respondents believing that people are more likely to advance in the workforce if their disability is unknown or hidden. This discrimination also shows in the ongoing lack of true accommodations for people with disabilities in most workplaces. Some install ramps and elevators to make physical mobility easier, but many conventional offices continue to use processes, technology, and systems that do not consider differences in ability (ie. paper filing, visual computer systems). This is a particular challenge for people with visual disabilities. The Canadian National Institute for the Blind estimates that over three million Canadians cannot read in the traditional way (or it is very difficult), which increases their difficulty in securing work. For people with disabilities who cannot work, there is a whole other site of struggle in receiving disability benefits. The 2007 Street Health report noted that cuts to social programs have had a catastrophic effect on low-income Canadians. At that time, Ontario welfare benefits were half of what they were in 1995 and disability benefits were 22% less. Once people have managed to apply, they often face extraordinarily long wait times for rejection or approval—sometimes up to two years. As most applicants are in dire need of their benefits as soon as possible, one might wonder what the point of applying is if it takes that long to be approved. “ODSP monthly allowance has increased by only $156 in the past 19 years. Disability beneficiaries receive $1086 a month under ODSP and this is set to increase to $1098 on Oct. 1, under the latest provincial government budget. While there are many benefits available for people with disabilities in Canada, these systems are not accessible, nor do they provide a living income for the vast majority of people who need them. As a result, some researchers have called for a basic income plan for people living with disabilities. According to the CHRC report, the number of adults in core housing need is 6.2% higher for those with disabilities. The report also found that a significantly higher proportion of adults with disabilities spend more than 50% of their before-tax income on housing than adults without disabilities. (10.3% compared to 7.7% in 2006.) This means many people living with disabilities are vulnerably housed and at risk of homelessness. As we’ve mentioned before, a lack of affordable housing combined with poverty and poor employment opportunities all contribute to homelessness. These causes are intensified for people with disabilities, some of whom need caregivers and other supports—making the search for independent, long-term housing very difficult. In 2013, 12,000 adults in Ontario were waiting for supportive housing in a system that is backlogged and engineered to solve crises, but not prevent them. If people with disabilities do become homeless, they often find themselves struggling to find shelters that can accommodate them. People living with disabilities comprise a significant number of people experiencing homelessness due to marginalization and the intersections of health and poverty; as well as a serious lack of employment opportunities, proper benefits, and housing/social supports. Photo credit: Help Change Disability Statistics, Rick Hansen Foundation.